I'm a little embarrassed to admit that when it comes to fall foods, I haven't been very adventurous. I do love pumpkin and have eaten it for years, but last fall was the first time I ever tried butternut squash, and that was only because my aunt insisted I try some. This fall, I vowed to expand my palate and try fall foods that I have never eaten before. 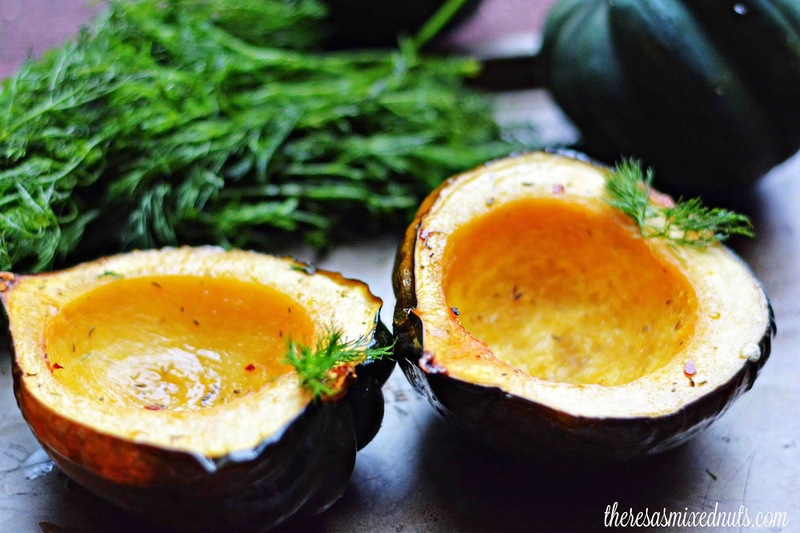 Roasted Acorn Squash popped in front of my eyes when I was perusing Golden Blossom Honey's recipes last week. I really thought about skipping over it, just because the "acorn" part of the name didn't appeal to me. We have squirrels that like to chuck acorns at us when we are on our deck, so I've got a few hard feelings toward acorns. But, I sucked it up and roasted a few for lunch earlier this week. I was surprised to find that I really loved it, though I think it's best served right out of the oven. I did save 1/2 for my lunch the following day and tried to eat it cold, but it just didn't have the same appeal as warm out of the oven. This recipe is definitely a fall keeper, and now I'll be looking into how to incorporate acorn squash into more of my fall dishes. I know! Isn't he just so sweet? I'm bitter and blue. Now, who's got my blue suede shoe? they certainly aren't the Ice Age Scrat type, he would never throw an acorn! If we could catch the little bastards, we might consider it. Those acorns HURT when they bonk you on the head! And, I caught one little squirrel trying to carve my pumpkins for me already! And you are right Dezzy. Scrat would be really angry and the wasted acorns! Awesome suggestions! I'm going to try the sour cream mix in for lunch today. Yum! that is how I used to make me a quick lunch: I just boil some red lentil with garlic and celery leaves for ten minutes, mash them, ad some sour cream or mayo when it cools down and nom nom with some whole wheat bread. Or the same but with a few brickets of frozen spinach boiled the same way. Forget the red carpet, dahlink. If I ever become rich, I am flying you over here to be my personal chef ;) You are a whiz in the kitchen! Ah... Just a spoonful? One? You like torturing yourself? Ours are very unfriendly. They like to harass the dogs too, standing just out of reach on the trees to taunt them. I might have to go all Halloween Nazi on them if they keep it up. You need a big Cat! I love roasted squash to. I'm a big sweet potato fan as well. I like sweet potatoes more than the rest of my family though. I did sweet potato pie last year too, and I really loved it! One thing I can't do are yams. My mom makes them every Thanksgiving and I just can't. They are so icky! You're right - that sounds like an awesome snack. I need to make this. I just made roasted acorn squash yesterday. I love those things!! I am doing a cleanse so I didn't put anything on them. 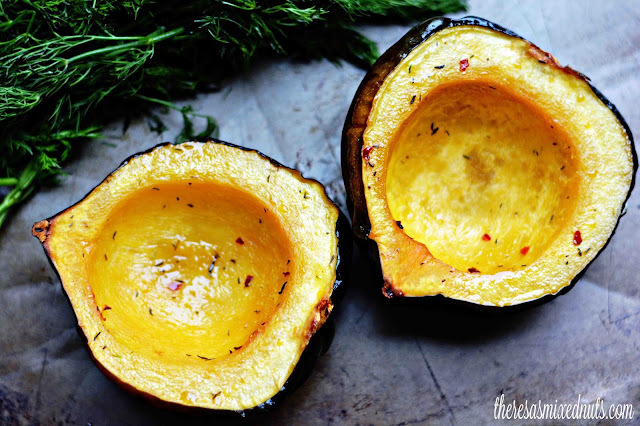 I love acorn squash in the fall! It's one of my favorite fall foods. This sounds yummy. I have never had acorn squash, but I would like to try it. I would love incorporating this dish into our fall meals. It sounds like such a comfort food. I have actually never had acorn squash! I need to give it a try! I love acorn squash. It seriously is one of my favorite foods! LOL at the acorn chucking squirrels. They used to store so many in my car's a/c box that I'd have to go to the mechanic a couple of times a year to have them removed. ;) I don't miss that at all!! The squash would be a nice treat though, and def. fresh out of the oven. Oh this sounds really good! I like squash, it goes great with my diet too! Healthy option! I don't think that I have ever had roasted acorn squash. It looks like the perfect food to enjoy in the fall. I've never roasted it before. What a great idea. I think I might have to give this a try and test it for myself. I've never had this before. The balsamic vinegar and honey combination sounds delicious. I love baking squash with butter and brown sugar. This looks like a delicious recipe to try. I love making roasted veggies this time of the year. Squash is one of my favorite vegetables to make. I will have to try this recipe. I have never tried making a spicy squash. This seems to be a great recipe to try out. It does look like it turned out good. Might make some for the weekend. Thanks for the recipe. This looks like an yummy recipe to try, a perfect one for the fall season. I have never tried out acorn squash before & I would want to give it a try sometime considering that it is such a healthy food too. I must confess I laughed a little about the acorns, but I was laughing with you not at you....oops you weren't laughing?? Yummy to the squash. One of my favorites! Roasted acorn squash? I don't think we have them here but I do love butternut squash!